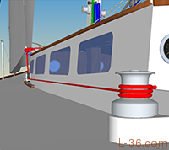 Many sailors I know find their boat's electrical system daunting. The very same people who will tinker with practically every mechanical device on their vessel, will for some reason, shy away from the electrical side of things. Perhaps this view is shaped by those salty-dog authors who dismiss electrical systems as new fangled, and prefer stinky kerosene instead. Or perhaps, sailors have forgotten their high-school science, although it is hardly more complicated than Ohm's Law. Regardless, you have nothing to fear, as electrical systems are very straightforward and equally reliable when properly maintained. I don't think there is a subject so misunderstood than velocity headers. They can take an entire fleet and get them to all stop dead in the water where a boat that recognizes what it going on can sail right through them. I know because I have done it. We went from last to first to finish in a fleet where we were neither the biggest, fastest, or lightest boat and yet there they all were stopped as we went right by, sails luffing away. There are many articles reviewing different ways of climbing a mast. There are also articles where people tell how they do it, their pet way. After frustration that none of the ways I have tried over the years or read about doing as complete a literature search as I could, would meet my goals, I went out and tried to come up with a new way, something that would meet my goals. This article reviews six ways of climbing a mast without help form anyone else. It talks about the pros and cons of each system and scores them on a set of criteria. The high score system is one I developed using some mountain climbing gear. I tried almost every mountain climbing mechanical and non mechanical assist that I could buy before settling on the system I like. This 8 page tutorial covers all the terms, positions, and tasks of flying a symmetric spinnaker using the end for end gybe technique. I have had Papoose for 23 years and never used a spinnaker on her. Last two seasons we won the local beer can series using a free flying jib downwind sometimes along with our normal jib. But we always had to play catch up to the boats that used spinnakers. I decided to learn to fly a spinnaker so we could move to the next level. I joined the crew of a very successful Tarten-10 for the winter series. I used a GoPro camera to document as much as I could. This training series of articles is the result. Lazy Lightning (the T-10) uses end for end gybes which are said to be appropriate for boats up to 35 feet. It is much simpler to rig and execute than a dip pole gybe so is the preferred method for boats such as mine which fly smaller spinnakers. This new tide page will show tide chart, table, and hourly tide or current. Search for a tide station by entering part of the name. Select from the list of possible stations. There is a list box that shows nearby stations if you want to switch locations. A map shows where the station is registered. To get the most accuracy from GPS based applications it is not enough to use the built in GPS in your phone or tablet because they do not have differential (WAAS) mode. Some applications can take advantage of higher update rates available in external GPS devices as well. In this article, I will explain why you might want an external GPS receiver, what the various Android drivers do, and why I picked "Bluetooth GPS Provider" as my preferred app. Finally, I will explain all of the Preferences in Bluetooth GPS Provider, something you will not find anywhere else. Note that as of Android 4.1 it is a little tricky to get these devices to work. Read on and find out what you need to do. NOTE: This is an article I wrote for our local yacht club newsletter. For background, so far this season I have come in first 6 times and second once. Last race we won by 4 minutes in a 6 mile race. I have been racing at SPYC for 5 years and that represents almost all my racing experience. I am thankful to the club for this experience and it has helped me a great deal to become a better racer. I am also grateful to other skippers who are far better racers than I will ever be for sharing many insights and tips on sailing. While I do not consider myself an expert racer, I would like to continue the tradition of sharing what I have learned in hopes of making other boats faster as well. In my case, there are two things that help Papoose win races. One is having lots of wind when racing against much lighter boats. The other is pointing ability. It is my hope that this article might help other people discover new pointing ability in their boats. 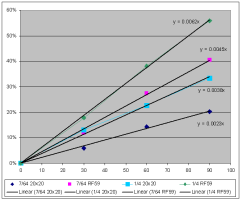 In the first article of this series we gave results on using fairleads and showed how the added friction is not significant with low deflection angles. 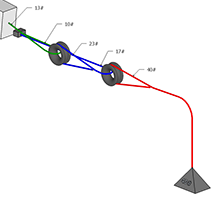 In this article we consider using low friction and other standard rings with high deflections and analyze how these can be used in systems to provide simple and inexpensive mechanical advantage. Again we used the digital scale shown on the right to make the measurements. This scale reads up to 220 pounds with 1/2 pound resolution. Using a digital scale, I was able to compare the no fairlead force required to just move my weight against the turning block that I had on the test bench to the force required to move the weight when there was a bend through one of two types of fairleads. I took data at many angles with both fairleads. I also took some data with different line types, specifically Samson XLS and Amsteel. 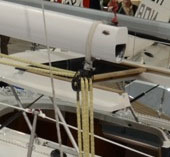 Do you find that you get wraps on your jib winches or just want give a better lead angle to the winch? In the last race we did, a new crew member got a wrap so tight that the only way to release it was to cut the sheet with a knife. We strung the lazy sheet to the secondary winch and took the pressure off but that was not enough to free the wrap, that is when the knife came out. 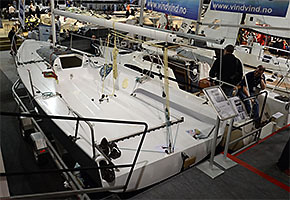 The winch manufacturer recommends between 3 and 8 degrees as the ideal sheeting angle. Everyone understands that a marine compass needs to be calibrated. I am not an expert on compass calibration but got interested in the question when a club member asked me if I had an article on the subject on this web site. It is easy enough to find articles on how to calibrate a marine compass but I found them lacking in two areas. First, they did not explain what was really going on such that I could understand why things were being done. Second, they all recommended you don't actually do the calibration yourself but rather hire an expert. Of course, because I only was presented with a how and a recommendation not to do it, I did not have the knowledge to judge if the procedure was going to be error prone if I did it without some of the fancy tools the professionals have. I kept thinking about it and doing a few experiments until I felt I understood what the goal of all these measurements was and how accurate they needed to be. Of course, I would be a fool if I didn't give the same advice, have an expert do the job for you. But after reading this you might at least understand what is going on and be able to judge for yourself if you think you know enough to calibrate your own compass.